Each year, writers and musicians from across the globe converge in Kosovo for the three-day Festival of Literature in Orllan, a vibrant celebration of local and international literature. Here, poet and translator Brian Sneeden offers an inside look at the burgeoning literary scene of the Balkans borderland. It’s just after 5am, and I’m sitting in a taxi jostling its way through the winding route back to Priština International Airport. After three days of relying on the superior language abilities of my multilingual Albanian hosts, I found myself struggling to communicate even basic phrases with the taxi driver. We get by on references pulled from American and British pop culture: “James Bond” for the remarkably out-of-place sports car stopped at a gas station, and “Alcatraz” for the cluster of barely visible prison lights in the distance. Somehow, this strange aerobics of catch-phrase translation feels like a fitting bookend of my visit to Kosovo. Having grown up in the United States, where it was more common to think of Kosovo as a war rather than a country, I was unprepared for the vibrancy and warmth I encountered during my trip. I’d just spent three days in a small, rustic village overlooking Batlava Lake in northeast Kosovo, where I was a guest of Faik, Ragip, and Valbona Luta, coordinators of the annual International Festival of Literature in Orllan. 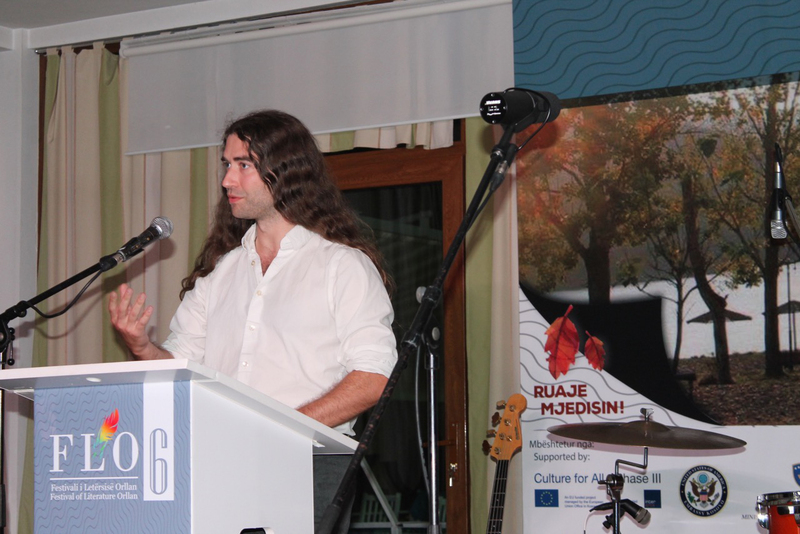 By the end of the weekend, I’d heard poems read aloud in Albanian, Bosnian, Croatian, English, Greek, Macedonian, and Spanish, and experienced firsthand the nascent literary scene of the Balkans borderland. the well in the courtyard. 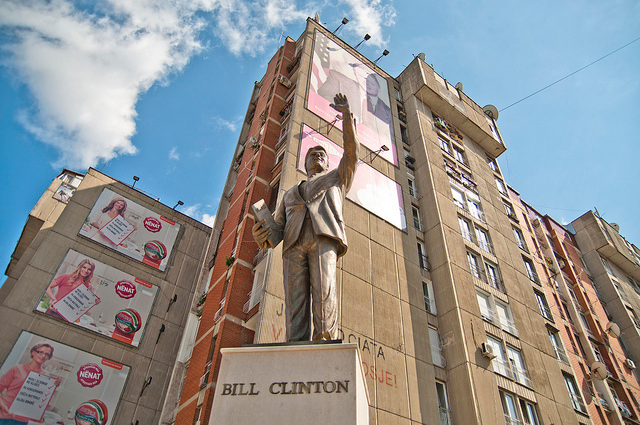 Entering the city of Priština, we pass the massive, sun-bleached mural of Bill Clinton overlooking Bill Clinton Boulevard, where the 10-foot statue of the former US president waves benignly in the general direction of the Sultan Mehmet Fatih mosque. Suddenly, the driver swerves onto the curb and points at a nondescript black storefront. “Hillary,” he says, indicating the façade of what I later learn is a family-run women’s clothing store specializing in pantsuit combinations worn by the former first lady. The shop was so successful, it had opened up a sister store, “Hillary 2,” just a few kilometers away. It was September 19, 2016, less than two months from the US presidential election, and everyone at the festival appeared confident the nation would follow in the footsteps of Kosovo, which elected its first female president, Atifete Jahjaga, in 2011. In the streets, the first few early risers were navigating the narrow sidewalks, and I was struck once again at how young the city feels: nearly everyone looks to be in their early twenties. As a nation, Kosovo is only nine years old, and although it remains a contested state, the list of countries that officially recognize its independence grows each year. Last year, Singapore and Suriname added their names to the long list of diplomatic recognitions received by Kosovo, joining most Western countries as well as broad sections of Africa, Asia, and South America, and Bangladesh recently became the 111th country to recognize Kosovo’s independence. Yet for long-entrenched rivals Albania and Serbia, the 4,000-square-mile country plays the role of a phantom limb. Rarely does a month pass without a representative from either government claiming hereditary rights over the country, and Serbia – arguably the region’s most influential player – staunchly refuses to recognize its independence. It isn’t until I’m sitting in Priština airport, thumbing through a local newspaper and drinking what may be my last good macchiato, that I learn the riddle behind the name Kosovo. Кос in Serbian means blackbird – Kosovo being its neuter possessive form as well as an ellipsis for Kosovo Polje: “Field of the Blackbirds,” site of the catalytic fourteenth-century Balkans battle. Subtracting the field – Polje – from Kosovo names its incompleteness, perpetually seeking its grammatical other. Even in the name there is already an absence. Subtracting the field – Polje – from Kosovo names its incompleteness, perpetually seeking its grammatical other. Even in the name there is already an absence. This was my first time in the country, and my airfare and lodging (I later learned) had been graciously sponsored by the United States Embassy in Priština. It was a significant honor, and one for which I could not help but feel unqualified. The guest speaker initially planned to headline the festival, Peter Constantine, was the foremost international translator of nine languages with more than forty books to his name – whereas I had only written just one book of poems and translated another from Greek, and frequently failed to put two words together in Albanian. Still, I found myself taken aback by the overwhelming hospitality of the festival’s coordinators, who involved me in everything from poetry readings to roundtable discussions on the topics of publishing and literary translation – all with the help of interpreter headsets rented from the United Nations and live translators who deftly pivoted from English to Albanian, to Bosnian and Croatian. 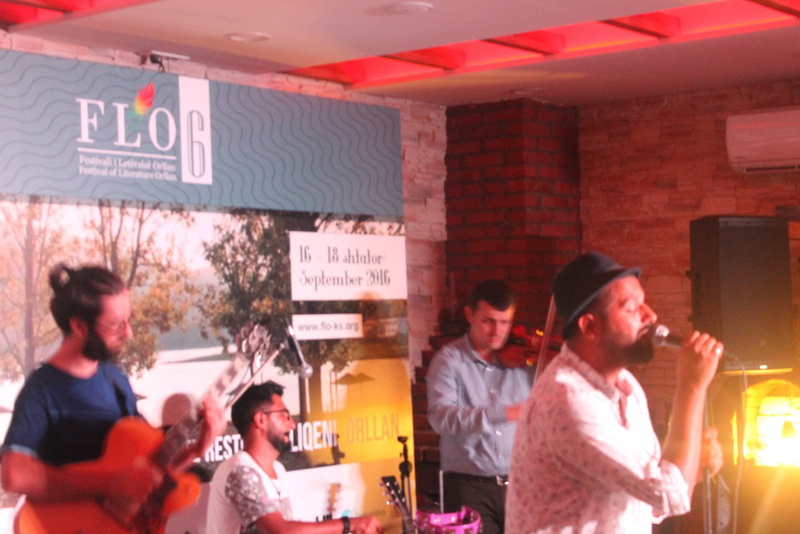 Evenings were filled with multilingual readings of poetry and prose punctuated by the folk rhythms of music groups such as Gipsy Groove, whose strings and vocals mixed the ecstatic melancholia of traditional gypsy songs with jazz-hop fusion beats. Listening to the poets, I found myself wondering what shape the national literature of Kosovo would take on. 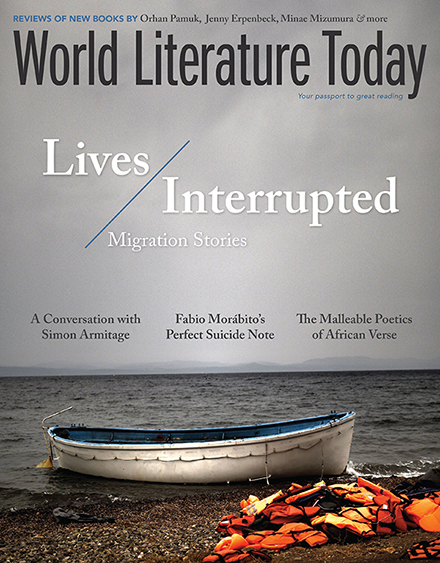 What effect will the persistent conflict and unhealed wounds of Albanian-Serbian political relations have on the young literary scene of Kosovo, and can literature – as Ragip and Faik nobly attest – play a role in healing lingual and political divides? What effect will the persistent conflict and unhealed wounds of Albanian-Serbian political relations have on the young literary scene of Kosovo? “Delicious tasty-fish” was the advertised specialty of the Restaurant Liqeni, where the festival was hosted. The dishes were all pleasantly Mediterranean – plates of mezze, massive salads, and thick cheese dips, with long green peppers floating in each soup and straddling the borders of each copious plate. Dinner was accompanied by red wine and rosé, while lunch was more or less an occasion for sipping rakiya, a clear Balkans spirit that stings the palate (a carryover from Turkish rule identical to the Cretan beverage of the same name). I’d been told that the coffee in Kosovo was extremely good, but I wasn’t quite expecting the cup of macchiato awaiting me on my arrival: deliciously thick crema, with a dollop of steamed milk floating in the middle. Above the tables, discussions of politics, authors, films, and obscure Italian TV shows lasted late into the evening. I was sampling an intimidating portion of flia, the national dish of Kosovo (Faik: “Think of it like a pancake containing 20 pancakes”) when the Albanian poet Primo Shllaku and I struck up a conversation on the Greek-Italian battles during World War II. “That happened on my land,” he says, giving a detailed description of the detritus of war discovered while working in his fields: bullets, helmets, rifles. “Every month there’s a new bayonet.” Also at the table is Ledia Dushi, whose vatic reading I recall vividly from the first evening. She and Primo take turns playing Greek folk songs on an iPhone, occasionally humming or singing along. Somewhere between the bouzouki-accompanied melodies of Kostas Hatzis and Mikis Theodorakis, Ray Charles’s rendition of “Georgia on My Mind” comes on to a round of singing. I am never so aware of my own inept knowledge of American music as when I am abroad. Everyone in the world, it seems, knows the lyrics to the Jackson 5 or Neil Diamond better than I do. In this instance I was able to at least hum along with the refrain, but my apparently inaudible contribution caught attention. “Brian, Brian,” Primo says in his gracious, elder statesman mien. “What do you mean you don’t know the words?” Having no excuse, I order more rakiya for the table and try to take in the surroundings. 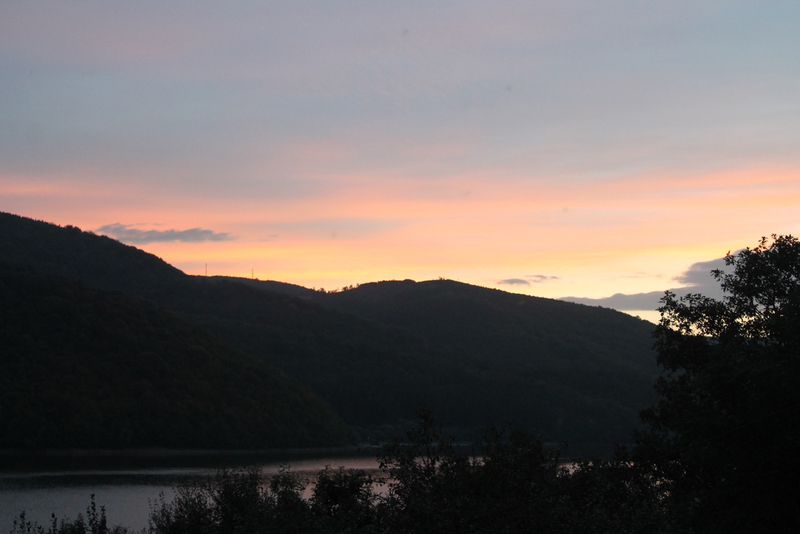 From our porch overlooking Batlava Lake, we are just nine kilometers from the Serbian border, a short and scenic drive through the hills on Route 39. But having flown in directly into Kosovo, I was forbidden to cross for a brief visit with my dear friend Danijela Trajković, who was currently translating my collection of poems into Serbian. I would’ve had to have entered by way of a neighboring country – a wide circle through either Macedonia to the south or Montenegro to the northwest, at least a six-hour detour either way. Anywhere else in Europe this would have seemed like an anachronistic exercise, especially for a region so enmeshed in the so-called “postborder” policies of the European Union. On the first night of the festival I find myself sitting in a row of poets, all of whom arrived earlier that day by car from Albania, Bosnia and Herzegovina, Macedonia, or nearby Priština. The interpreter is booked elsewhere that first night, so I find myself sifting between listening and hearing as the readers weave in and out of languages. I cannot make out a word of Ledia’s poetry, but I’m electrified by her Delphic intonations, tapering to whispers, as she reads her lyric poems punctuated by applause. Primo speaks softly into the microphone, slow and then increasingly faster, the assonance incantatory before receding again into one of his many silences (later I ask him where he developed his reading style: “the auctioneer,” he says with a wink). Half an hour later, Ledia nudges me: he’s introducing you, and I recognize the familiar pronunciation of “University of Connecticut” and Last City, the name of my collection of poems. I’m convinced everyone in the room speaks exemplary English, yet still Ragip and Faik went through the trouble of sending my poems to a regional translator to be transcribed into Albanian. Standing at the podium, I glanced at the Albanian text scrolling on the wall beside me: a beautifully indecipherable code of umlauts and slip-syllables, reminding me at times of Greek, and other times something closer to Dutch: “duke mos bërë gjë / ata po ndërtojnë një dhomë për shiun” (by doing nothing / they are building a room for the rain). Later at dinner, someone tells me the translator, Fadil Bajraj, is cherished in Kosovo for his renditions of American and British poetry, and I feel immediately lucky. Around midnight, everyone at the table is either too tired or tipsy for English, and the conversations around me quicken to a rapid-fire staccato. It is my favorite time: the tables stacked with smoke swirled by the odd gesturing hand, the flickering guitar coming from the street or a back room, plates filled with olive pits and the curved stems of peppers, the spit of laughter. Outside, a kitchen light turns on in the distance, the blinking eye of the village. “The era of epic poetry is over.” Such a statement from a poet writing in any other Western tradition would likely pass as anachronistic. Yet when Albanian poet and novelist Ismail Kadare made the observation in his 1998 Paris Review interview, he was motioning to a radical shift in Albanian poetry. For over a century, modern and contemporary Albanian poets composed in the shadow cast by a rich, long-standing oral tradition of epic poetry. Through the early 1900s, recitals of epic sequences in verse – accompanied by a single-stringed instrument called a lahutë – were the mainstay of the region and relied on a complex system of traditional meters punctuated by improvisation. The Gheg dialect, with its morphic phonology and abundant palatal stops, was an ideal conduit for the long, formulaic verse poems such as the undated “The Ballad of Constantin and Doruntine.” In the 1950s, the use of Gheg in speech or in writing was made a criminal offense by Albanian Communist dictator Enver Hoxha, under the guise of resolving the lingual divide between the southern Tosk dialect and the northern Gheg dialect. “Gheg was banned the way free speech was banned,” Primo tells me. Flipping through his collection Lule nate (Night flowers), I find so many of Primo’s poems are, like that of so many American and European poets, short and nearly exclusively lyric. Had I not come to Kosovo, I would likely have taken Kadare’s comment at face value – now I see that the oral epic lives on in contemporary Albanian poetry, yet not in a way that would be immediately recognizable reading the poems on the page. It’s during performance that these short, intensely lyric poems assume their bardic inheritance of lilt and cant, composing with the breath-length of the image, the pregnant pause, the repeated line. During performance these short, intensely lyric poems assume their bardic inheritance of lilt and cant, composing with the breath-length of the image, the pregnant pause, the repeated line. On the flight over I had read Kadare’s novella on the fourteenth-century Battle of the Field of Blackbirds entitled Elegy for Kosovo (translated by Peter Constantine). In the story, two minstrels – one Serbian, one Albanian – reunite in the wilderness after witnessing the fall of the decorated armies of the combined Balkan kingdoms to Turkish forces. Finding themselves in a distant land, they begin to play before the court only to be ridiculed for the divisively sectarian tenor of their songs: “A great fog is covering the Field of the Blackbirds! Rise, O Serbs, the Albanians are taking Kosovo.” “A black fog has descended – Albanians, to arms, Kosovo is falling to the damned Serb.” It is only when they are asked to break from tradition, and to improvise a new composition on the spot, that the minstrels find themselves capable of creating a new narrative, with one’s story interweaving with that of the other. Would appear and slit her throat. Unlike the Bosnian cities of Sarajevo and Srebrenica, Priština was never besieged by Yugoslav forces, but conflict in nearby regions resulted in the displacement of an estimated 90 percent of the city’s inhabitants. None of Konushevci’s poignant essays on the war or Albanian poetry have appeared in English, and like many Albanian poets, his poetry has only been made available for English readers by the extensive work of Robert Elsie, whose website, albanianliterature.net, remains the largest published body of Albanian literature to appear in English. 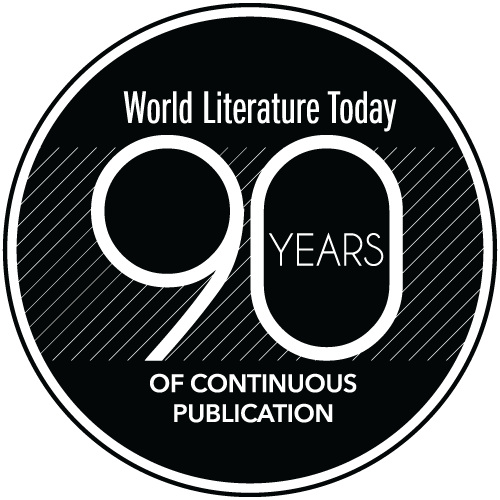 Konushevci’s contribution to the archive consists of only eleven short poems (alongside Ledia’s, Primo’s, and others), yet no complete volume of his poetry has been published in English. With those shadows of fallen friends. “Jazra is very good,” Primo says reflectively, “although we think from two different stages: he wants a revolution, I have seen a revolution.” My mind travels to the occasional symptom of postrevolution visible in my rides through Priština and the countryside: the gray concrete exteriors of unfinished walls, the conspicuous gaps between rows of houses, roofs patched with mismatched building material, like loosely treated wounds. under the rustle of the leaves. At Orllan, on the shores of the Batlava Lake, the waters of the present moment felt nascent and clear, yet sustained by the interwoven tributaries of a trauma I could not begin to know. Let us assume that the present is a body of water of particular colour and depth and that our bodies are immersed in it. Every body submerged in water is lighter by the amount of liquid it displaces, according to Archimedes’ principle. But none of us ever come up to the surface, except the mad and the dead. The weight of our individual traumas can therefore be measured by the amount of the present displaced by our bodies. At Orllan, on the shores of the Batlava Lake, the waters of the present moment felt nascent and clear, yet sustained by the interwoven tributaries of a trauma I could not begin to know. I was visitor to it, but not a tourist. Looking ahead, I found myself wondering what poets and artists next year’s festivities will bring, and in what ways it will continue to draw international attention to this up-and-coming literary scene in Kosovo. Thanks to the efforts of Faik, Ragip, and Valbona Luta, the Festival of Literature in Orllan was, for me, a space where the present moment could linger untouched. Brian Sneeden’s first collection of poems, Last City, is forthcoming from Carnegie Mellon University Press (2018). His translation from Modern Greek of Phoebe Giannisi’s collection Homerica is forthcoming from the inaugural series of World Poetry Books (2017). He is the senior editor of New Poetry in Translation.